One Room Challenge 2018 Spring Week 4 progress update. I’m joining Linda the creator of the One Room Challenge along with featured designers and House Beautiful. This is my fourth ORC and I think my toughest one yet. Welcome! UPDATE: See the Backyard, Patio and Deck Makeover REVEAL! Oh friends, this was a tough week. I thought I was mentally prepared but apparently not because there were tears. I’ll get to that shortly but first, here is a little update. This week was all about black. 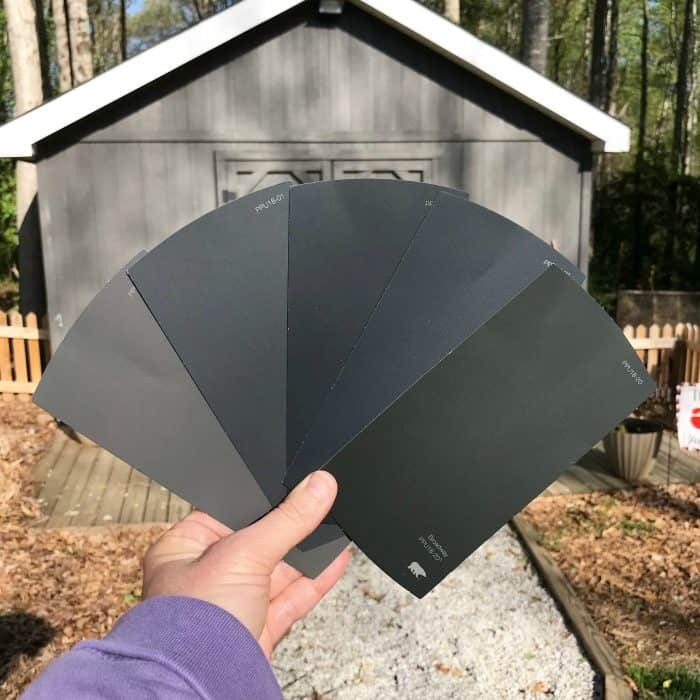 Choosing colors for the fence and the shed had me spinning. Black is a notorious hard color to choose. 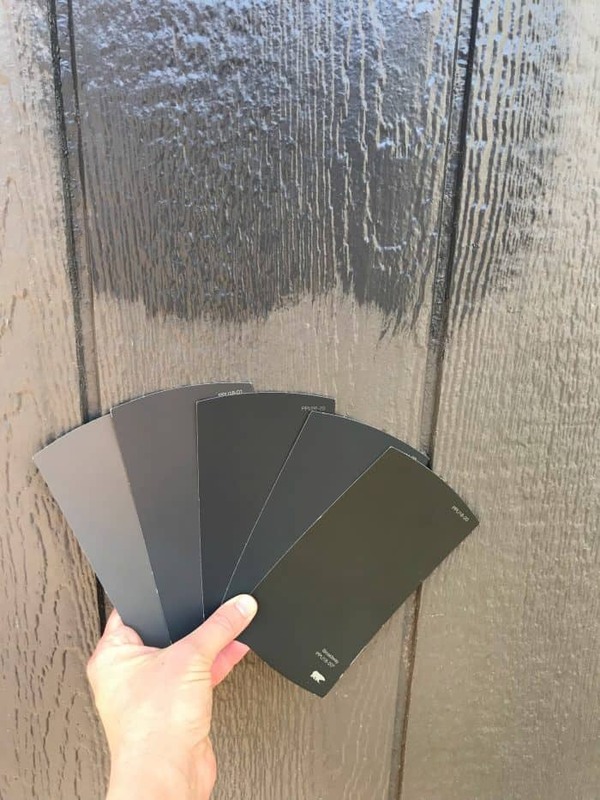 I’ve written an entire blog post called Best Black Paint Colors to teach you all what I have learned over the years. I think I will need to update that post now including many more options. The hardest part was the sunlight and shade and how they really change the color of the paint. This is always true in our home and why colors look different at throughout the day. So I started with these samples. The one on the far left is the color on the shed. Not the original color but one very close in order for me to see the difference while deciding. The sample on the shed is called Cracked Pepper. I wanted a black that did not look blue so I had the guy at Home Depot check and it didn’t have blue in it. All of these samples are from Behr paint line. At first I didn’t think it was dark enough. As the day went on and it turned night, the color was really dark and I LOVED IT! 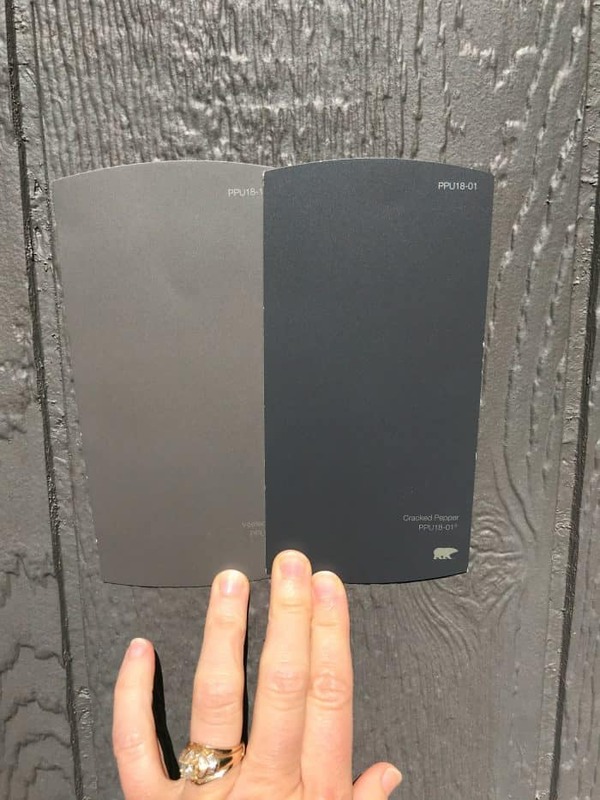 Here is a side by side of just the two colors. 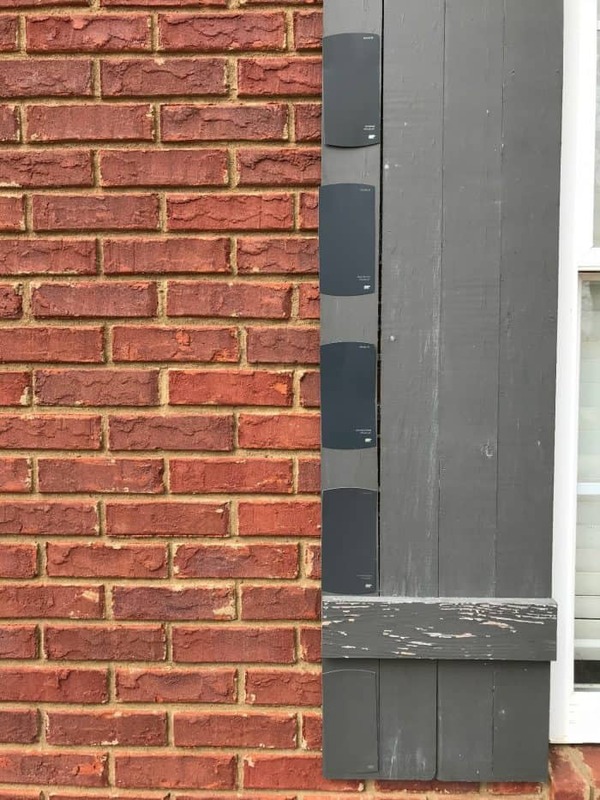 This is a look at how the color will look on my DIY Shutters on the front of my house. They are in much need of TLC. relatively easy build if you’d like to make your own. Here is a last look at the shed before the final reveal. The colors look so great and I can’t wait to show you. 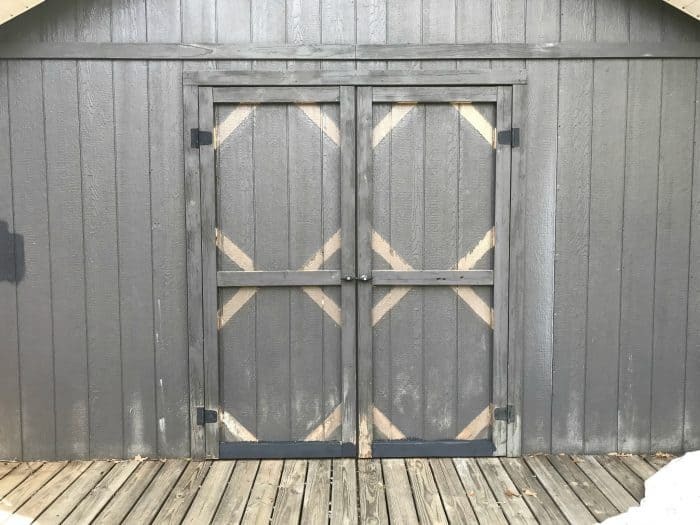 We removed the cross strips of wood on the doors for a more streamline look. You’ll have to wait for the final makeover to see though! NOW, back to the crying. I was already having a hard time with the fence. It was much harder to do than I thought. I ended up remembering I owned a professional Home Right Sprayer and it saved the day. BUT this happened…and I literally sat on the ground and cried. 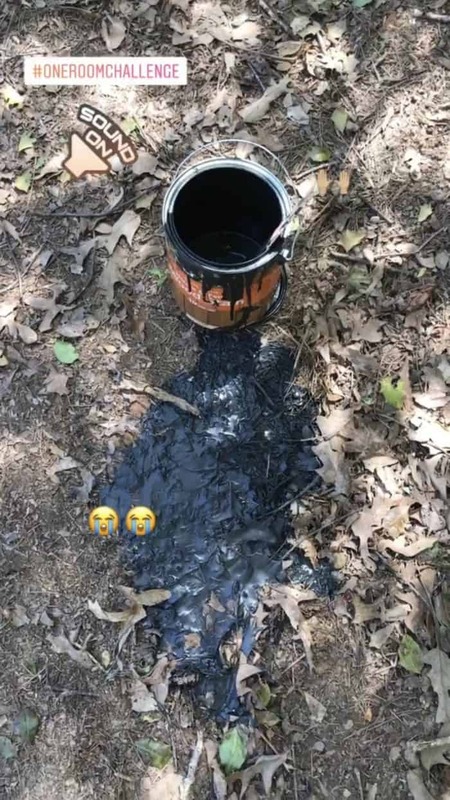 I accidentally knocked the paint can over with the sprayer. I wasted over half a gallon of paint. Everything turned out well and the fence and shed are stained and painted. 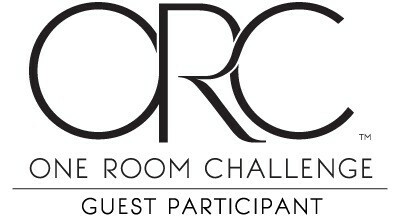 Be sure you check out all of the participants in the One Room Challenge. Be sure to follow along on Instagram where I share some updates in my story. I want to see how the shed turned out so badly!! I can’t wait for the reveal! The black you went with looks great! Can’t wait to see the shed in it. Such a bummer about the paint! I once picked up a gallon of paint and went to shake it, while in my regular clothes including my one pair of “good” jeans, and the lid came flying off and paint went all over my foyer walls, floor, furniture and me!! It was kind of comical actually! So at least you spilled it outside right? 🙂 Good luck this week!